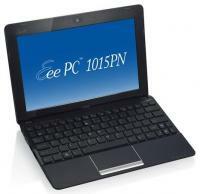 Asus Eee PC 1015PN specifications, info. Nvidia ION 2 should be able to handle 720p and 1080p HD playback. HDMI output combined with ION will make this great for plugging into the big screen and watching HD movies or other desktop TV experiences (Hulu, Netflix, Boxee, etc.) without requiring that the computer be permanently hooked up next to the computer. Second generation Nvidia ION graphics with Optimus technology for dynamic switching between ION and integrated graphics.